For all queries about the BlueWaveTrading NinjaTrader Algorithmic Trading Systems please contact BlueWaveTrading directly at http://www.bluewavetrading.com Randy will be delighted to assist. MicroTrends was commissioned in 2013 by Bluewave Trading to fix the overfills and some other problems left by other listed professional NinjaTrader developers. The system had been worked on a catalog of other developers and the code base was unreadable and unmanageable and written using the default NinjaTrader convenience layer – meaning that the system could error and halt based on a overfill. Over fills are a potentially dangerous issue that can occur when using complex entry conditions that bracket the market in both directions end up with both entries being filled instead of one being cancelled. By default, NinjaTrader will protect against overfills by halting the strategy, which is not desirable as the strategy closes all positions as a market order with slippage, and deletes the strategy from the chart losing control of the strategy. There was no choice but to re-write the system using a new layer/engine underneath the original code based using NinjaTrader Professional Unmanaged Mode. The Unmanaged approach is reserved for VERY EXPERIENCED programmers. In place of the convenience layer that the Managed approach offered, the Unmanaged approach instead offers ultimate flexibility in terms of order submission and management. In February 2014 BlueWave was so pleased with the outcome and also loved the MTDS7 Strategy Framework with the NinjaBuddy UI system we had and so we partnered up and merged in our MTDS7 NinjaBuddy, realtime interactive controls, realtime settings and trading user interface features, order indicators, profit and loss info bar visualizations and indicators, including an advanced trade workflow safety engine that avoids trade related errors. The outcome of the project is that BWT Precision Autotrader code base is now professionally written with advanced coding techniques proprietary to MicroTrends, licensed to BWT, allowing traders to trade with confidence avoiding and resolving overfills, entry and exit order errors and other potentially dangerous automated trade scenarios. The development project lasted over 18months full coding and testing support to the end of 2015, the project from 2014 then structured as partnership until 2016 where by BWT now sells and supports all of the system and it is rated by traders and his partners as one of the best coded automated trading systems of all time – being a user friendly merging of Randy Sarrows trading design and approach powered by MicroTrends Trade engine and trade management UI & algorithmic frameworks. One key feature of the BWT Precision Autotrader is that it is Professionally Coded 100% in NT unmanaged mode. The official NinjaTrader Documentation states:” The Unmanaged approach is reserved for VERY EXPERIENCED programmers. ….In place of the convenience layer that the Managed approach offered, the Unmanaged approach instead offers ultimate flexibility in terms of order submission and management….. Writing code in unmanaged mode requires extra time and effort and requires a significantly higher coding skill set, that most NinjaScript listed professional Developers simply do not have… I say this with complete confidence because at one time or another over the last 8 years, I have personally worked with almost all of them! Please note this product is alive and well, In 2016 BlueWaveTrading’s CEO Randy Sarrow saw fit to take over the open source of the project due to a difference of opinion over MicroTrends terms and our immersion and lack of availability due to hedge fund trading in 2015 onwards and so inadverntly cut out the MicroTrends involvement and any future payment for the agreed technology license share and took over all aspects, against our MNDA and agreement in place without our consent or knowledge. The code was shared for disaster contingency/insurance so that the product would live in case of the demise of MicroTrends or its developer. MicroTrends wished BlueWaveTrading the very best in the their future trading products and their trading endeavors & goals. MicroTrends were happy to make a difference for all concerned. To take a legacy product with great potential and make it live past all expectations. 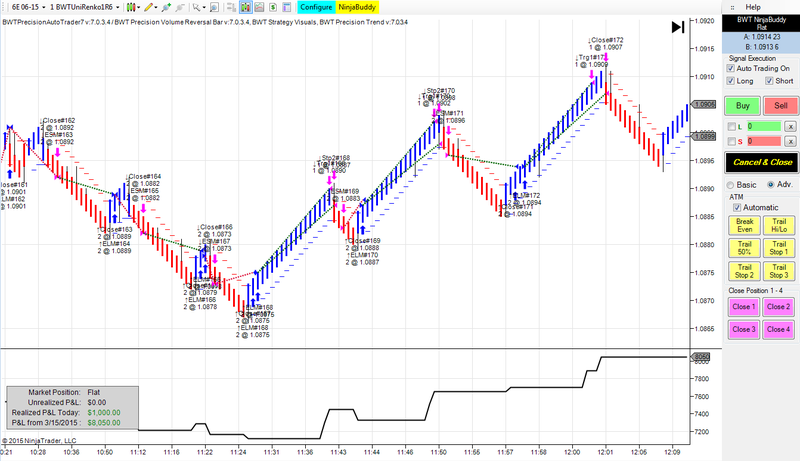 Simply all we did was to inject and merge in our NinjaTrader strategy algorithmic trading experience, technology and concepts jointly with Randy, whom has a very keen “clean eye” for what makes life easier for a trader graphically and in terms of features – jointly the end sum was the best user friendly, retail trading product for NinjaTrader 7. This was a very synergistic project with the best outcome for the vendor and the trades who use it. We were proud as the official development partner and lead the product into the shape and form it has enjoyed by all. How to buy? You must order this product from Randy and get his support and attention correctly. We will not provide the product and no longer have it or the source codes – to provide full control and concerns to BWT in all regards.